The call centers at the center of the scam investigation were headquartered in Thane, a suburb outside of Mumbai, India. In an interview with Forbes India, Thane Police Commissioner Param Bir Singh discussed Thakkar’s role in the scam, suggesting that he was more of a “greedy youngster than a hardened criminal.” Thakkar, known as “Shaggy,” was said to be making more than 10 million rupees ($155,000) a day, or over a million dollars per week, at the scam’s peak. When police Indian police finally zeroed in on the call centers, Thakkar fled to Dubai. At the time, police arrested 70 call center workers for their alleged roles in tax-related scams and detained hundreds more. Using personally identifiable information obtained from a number sources, including social media, scammers had impersonated agents from the IRS or US Citizenship and Immigration Services (USCIS). Calls to the United States were typically made using VoIP (voice over internet protocol) technology which allowed the scammers to “spoof” the phone numbers, making it appear that the calls were coming from the IRS or other government agency. As part of the scam, taxpayers were told to pay bogus tax bills immediately or face arrest, deportation, or other legal action. The scam was wildly successful. At one point, the U.S. Treasury Inspector General for Tax Administration (TIGTA) referred to the scam as “the largest scam of its kind that we have ever seen” – and that was in 2014. By the end of 2016, the Better Business Bureau advised that the IRS phone scam was the most popular scam of 2016, accounting for 1 in 4 reported scams. 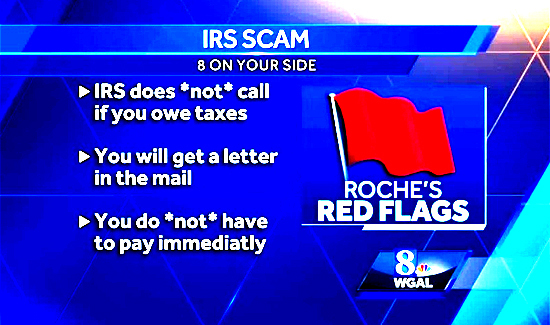 And of course, the scam continued to top the IRS list of “Dirty Dozen” scams affecting US taxpayers.